Art-C: Rangoli.....the painted prayers of India!!! Rangoli.....the painted prayers of India!!! 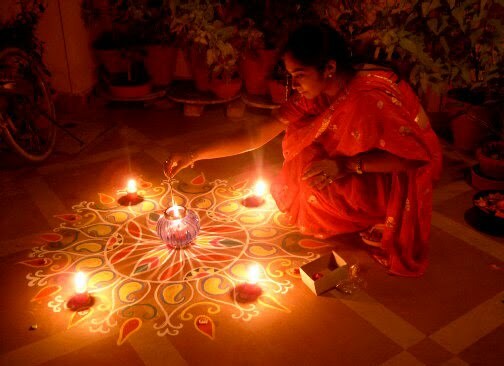 A must see traditional art form in every Indian home especially at the time of festivals, is the Rangoli which is a form of sandpainting i.e decoration done on the ground or walls using finely ground white & coloured powders or even flowers. Also called the painted prayers, the term rangoli is derived from the words rang (colour) and aavalli ('coloured creepers'). 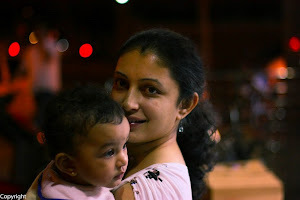 It is known with different names in different parts of India, Kolam in Kerala, Alpana in Bengal, Madana in Rajasthan etc. The art of Rangoli is said to have its origins in a legend recorded in the Chitralakshana, the earliest Nepalese treatise on painting wherein the Hindu God Brahma is said to have painted the likeness of a boy to breathe life into him. Due to its religious origins, rangoli is considered as a spiritual ode & is mostly done on auspicious occasions like festivals (Diwali) & weddings. Hindus also do it daily either infront of their homes or on the walls. 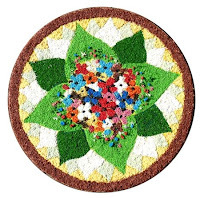 Rangoli designs are created by sprinkling coloured powder (uni-dimensional effect) or foodgrains (3-D effect) mixed with a base (i.e sand/ marble dust) by hand on the ground. These intricate designs & motifs are either symbolic & include geometric patterns with lines & dots or they can be landscapes or figures. Generally no part of the picture is left blank because it is believed that it can be tainted with an evil eye. The designs are beautiful to behold & just reflect the fact that every person is born with an artistic bent of mind!! !